There has, of late, been a revival of Punjabi cinema directed towards and watched by Punjabi audiences. A recent addition to Punjabi language cinema, albeit less ‘commercial’ and more ‘artistic’ is the Punjabi language film Qissa: Tale of a Lonely Ghost which has been doing the rounds at international film festivals and was screened last week at the London Indian Film Festival. The film is about the violent consequences of son obsession in a Sikh refugee family in post-partition East Punjab.Visually striking, Qissa stands out for its cinematography; the framing, the use of shadows and light, the unusual angles. It was often absorbing, most of all in the scenes between actresses Tillotama Shome and Rasika Dugal, playing the couple Kanwar Singh and Neeli who find themselves in a predicament after marriage when they both discover that Kawar is actually a woman. Their interactions quiver with layered tension and chemistry. Ultimately, however, the film doesn’t quite come together, it seems to lack internal coherence. I found myself watching it with a sense of unease, it didn’t carry me through, and when, in the post film discussion, the director spoke about the qissa tradition, connecting his film to this ‘genre,’ my discomfort increased. 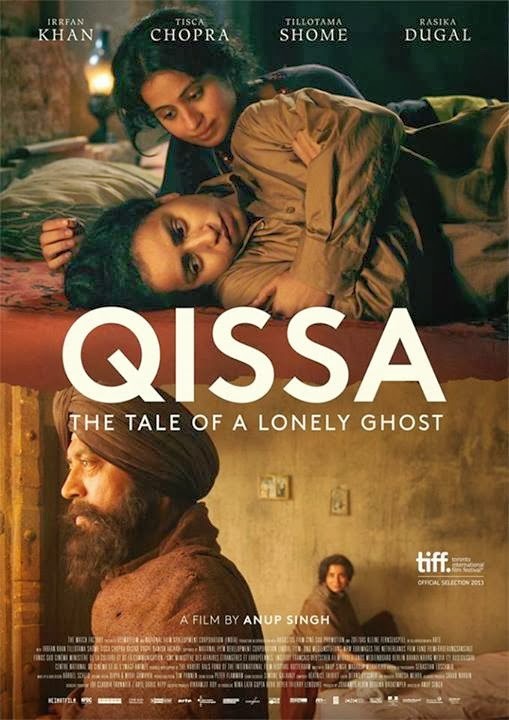 Encompassed in the title, in the main heading (Qissa) and the subheading (The Tale of the Lonely Ghost), are two very different conceptions of storytelling, the film seems to hover between both of these, but falls ultimately, in the framework of the latter. The Qissa is a storytelling tradition that is woven into the lives, culture of Punjabis. Qissas have been retold, reinterpreted in each era, often through music – the Sufi versions of these stories that are most well-known. Rooted in time and place – it is through particularity, detail, a connection with everyday life that qissas speak to the people of the region. Waris Shah weaves into Heer, perhaps the most popular qissa, painstaking, almost sociological detail about the customs, practices, beliefs, social, economic and political structures of the time. Qissas often portray, through love stories, the defiance and rebellion of ordinary people, exploring the radical potential of love and sexuality, as lovers and their accomplices defy the conventions, religion, ‘morality’ of an oppressive society. Qissas, in this way, critique social, political institutions, challenging power at all levels. While the lovers in Sufi qissas simultaneously symbolise the relationship between devotee and pir or guru, it is through the details, the emotion and earthiness of lived life that they become metaphors, that they become universal. Sufis understood that this was the way to connect with people. The meeting was very Kindly hosted by Dr Tahir Kamran, Chairperson, Department of History, GC University, Lahore. The theme of the sixth annual ETMU Days, Finland and Innovative Cultural Diversity, is being approached from several angles. The purpose of the event is to create an open dialogue for researchers and representatives of different sectors and to discuss Finland of tomorrow. The ETMU Days in Joensuu will offer a multiform ensemble including scientific presentations, workshops and roundtable discussions on current topics. The theme area of the ETMU Days can be approached from following directions: ethnicity, international mobility, multiculturalism, integration, indigenous and national minorities, minority rights, citizenship, nationalism, racism, refugees, religion, gender, education, upbringing and comparable topics. The speakers at the conference are Professor Doreen Massey (Open University, UK), Professor Tariq Modood (University of Bristol), Dr Aulikki Sippola, Professor Ari Lehtinen (University of Joensuu) and Docent Pasi Saukkonen (CUPORE, University of Helsinki). Also MDs Merja Räihä (Prokura) and Kim Väisänen (Blancco Ltd) are to be given the floor as well as to the presentatives of ministry level and EU. The languages of the conference are Finnish and English. Please, send your suggestion for a workshop Several workshops dealing with the above mentioned themes will be held at the conference. Researchers, research groups and students of the field may suggest topics for these workshops. The suggestions should include the name of the workshop and an approx. 200-word introduction to the theme. Suggestions should also specify the language of the workshop to be used and are to be submitted by 30.03.2009. We are also searching for co-ordinators for the workshops. Their task is to choose abstracts for their workshops and function as chairpersons. The co-ordinators themselves are also welcome to suggest topics for workshops. As each workshop is established, information about it will be added to the website of ETMU and abstracts for them can be suggested from that moment onwards, yet latest in August 2009. Together with University of Joensuu (Karelian Institute, Department of Finnish Language and Cultural Research and Department of Sociology and Social Policy). In collaboration with University of Eastern Finland and North Karelian University of Applied Sciences. CCIS will offer a limited number of Visiting Research Fellowships at both the predoctoral and postdoctoral levels for the 2009-10 academic year. These awards are to support advanced research and writing on any aspect of international migration and refugee flows, in any of the social sciences, history, law, and comparative literature. Due to funding constraints, CCIS is able to award fellowships only to scholars who have a current or former affiliation with a University of California campus (as a graduate student, faculty member, or researcher). Self-funded Guest Scholars are not required to have a UC affiliation. Fellowships must be held in residence at UCSD (commuting from outside of San Diego is not permissible).